Soak the gelatin leaves in cold water for approx. 5 min. Halve the vanilla bean lengthwise and scrape out the seeds with the tip of a sharp knife. Add the heavy cream, vanilla seeds, scraped-out vanilla bean, and part of the sugar to a pot, then bring to a boil. Simmer on medium heat for approx. 5 min. Pour vanilla cream mixture through a fine sieve into a bowl. Remove gelatin from the water and squeeze out any excess water. Now dissolve gelatin in the hot vanilla cream. Cool the cream mixture over iced water, stirring throughout until it thickens slightly. This prevents the vanilla seeds from dropping to the bottom. Rinse ramekins, cups, or glasses with cold water, then fill in the cream mixture. Refrigerate for approx. 3 – 4 hrs. 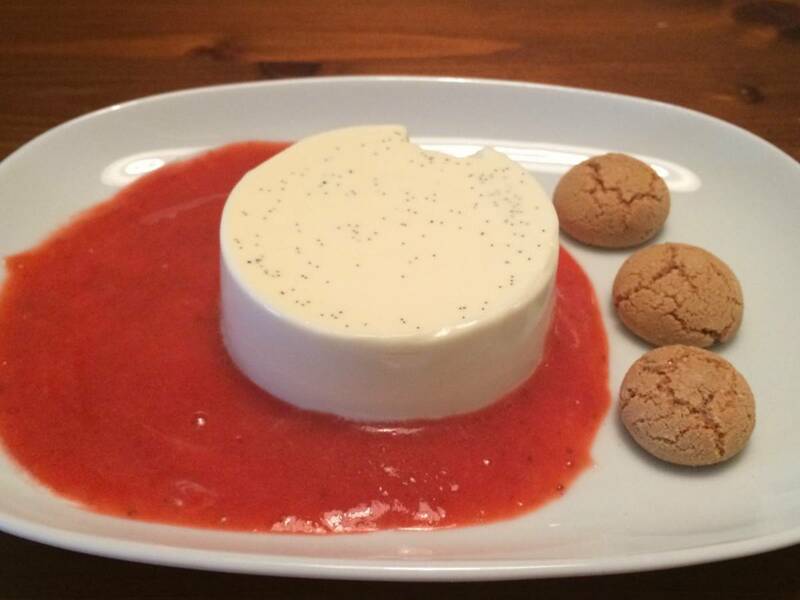 To release the panna cotta from their forms, briefly immerse the ramekins in hot water and turn out onto the dishes. Alternatively, serve in the ramekins. To make the strawberry sauce, add strawberries, part of the sugar, vanilla sugar, and water to a saucepan, and simmer for approx. 10 min. Then puree and cool down. Serve with the panna cotta.